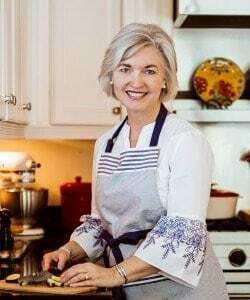 Over the years I’ve made the original Rice Krispies Treats, a timeless childhood favorite, and have experimented with lots of different delicious and fun variations. 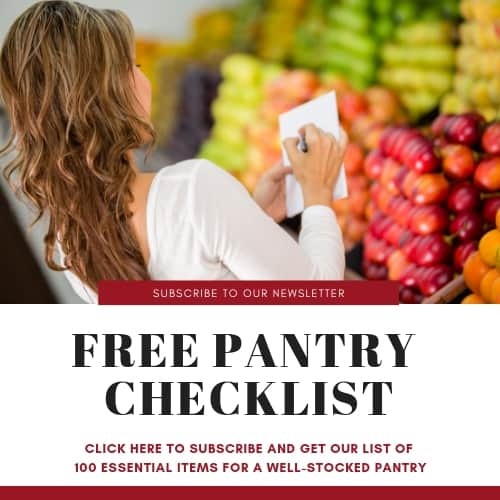 Basically, it depends on what I have available in my pantry — candies, chocolate, peanut butter — and I’ve never been disappointed with this go-to, quick sweet treat. This is a recipe that allows for a little creativity. 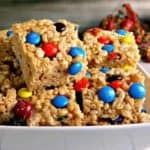 Today, I’m sharing Peanutty Rice Krispies Treats with peanut butter and M&Ms chocolate candies added. 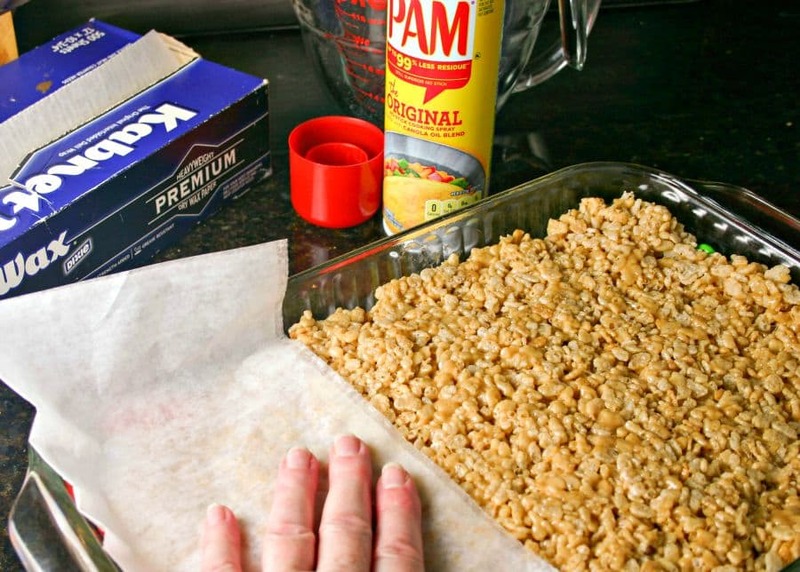 Now here’s the real trick — once you’ve stirred in the Rice Krispies, pour into a 9×13 inch dish that you’ve coated with PAM Cooking Spray. Also spray a piece of wax paper and use that to press the mixture into the pan and smooth it out with no sticking! You have to work quickly because the mixture starts to set up as it cools and using PAM Cooking Spray and wax paper has been the method that works best for me. PAM leaves 99% less residue than margarine or bargain-brand cooking sprays too. 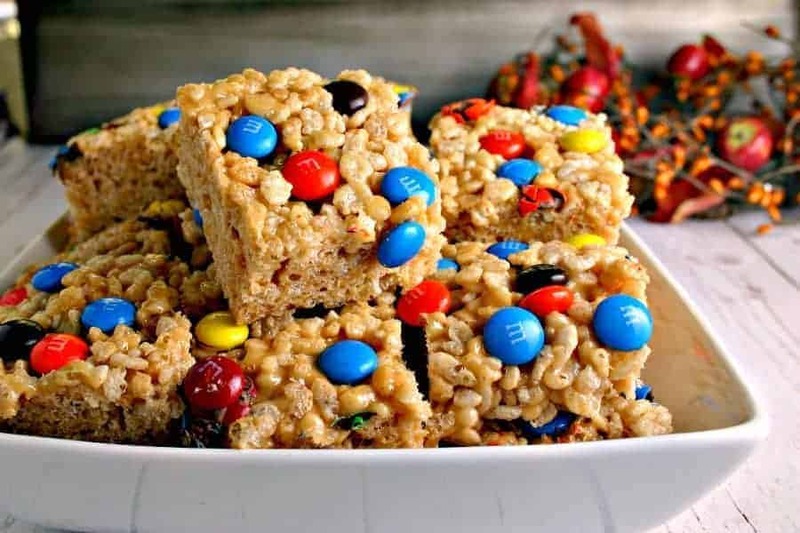 Peanutty Rice Krispies Treats - a variation on the timeless childhood favorite. Spray the bottom of a glass 9x13-inch baking dish with PAM cooking spray. Sprinkle M&Ms evenly into bottom of dish. 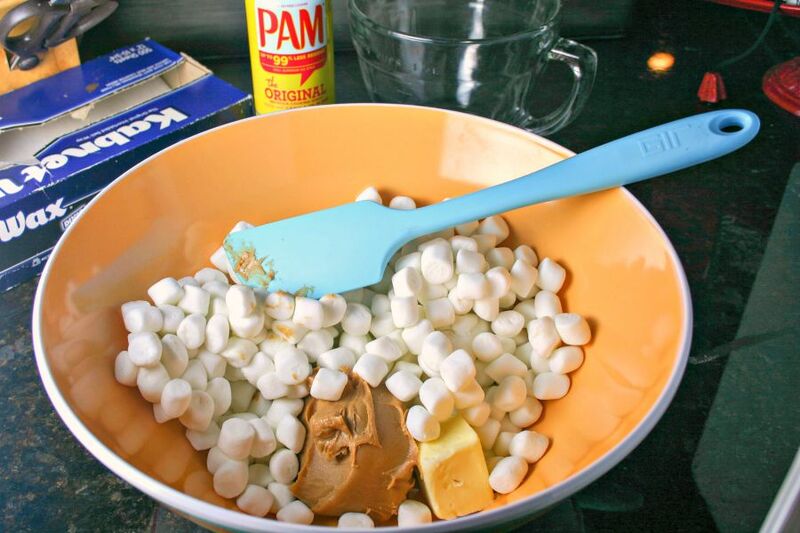 Add marshmallows, butter, and peanut butter to a large microwave safe bowl. Microwave for two minutes. Remove carefully (mixture is hot and sticky!) and stir with a wooden spoon or rubber spoon until smooth and completely melted. If needed, microwave in 30 second increments until smooth and melted (microwave ovens may vary). Quickly stir in Rice Krispie cereal until just coated. Pour into dish on top of candies. Spray a piece of wax paper with PAM Cooking Spray and use the coated/sprayed side to press down and smooth out the mixture. Allow to cool completely before cutting into squares. The M&M’s are such a fun addition to rice krispie treats!